The first show that I attended was the Ultimate Fishing Show with plans to make a decision on what I was going to buy. I had now figured out that in order to have Side Imaging I would need a transducer that would have to be installed outside my kayak, so my decision was to get a unit with Down Imaging in order to have a thru hull installation. The demos that were showed to me on the Lowrance units still had me wondering how I was going to use this on the lakes I was fishing. 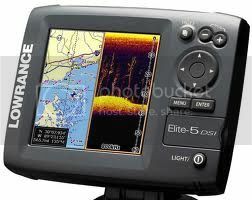 It wasn’t until the next show I attended in Monroe, Michigan where an exhibitor that had both Lowrance and Humminbird units on display showed me the screen view on the Humminbird 788ci HD DI that had both sonar and DI. When I asked him to show me the same view on the Lowrance he said that it wasn’t available on these units. I now knew that I was going to purchase the Humminbird Unit regardless that I had to reinstall new transducers on my existing kayaks. This is a view available on your Humminbird unit specifically the 597ci HD DI and 788ci HD DI. On the DI screen it is sometimes difficult to see suspended fish as they look like dots most of the time where large species like Muskie or large Salmon, Trout, and Walleye will show as large arcs on the Sonar screen. It took me most of the season to learn and understand using both sonar and DI. It wasn’t until I was fishing on Sleeping Bear Bay on Lake Michigan in September of 2011 that I realized the difference of sonar and DI. The screen above does not show how different fish really look on the 2 screens. When there were large salmon suspended 30′ down in 50′ of water I could see large arcs across my sonar and below on the DI screen they were small dots. On a 5″ screen it would be hard to tell a large dot from a small dot if you are looking for suspended fish. 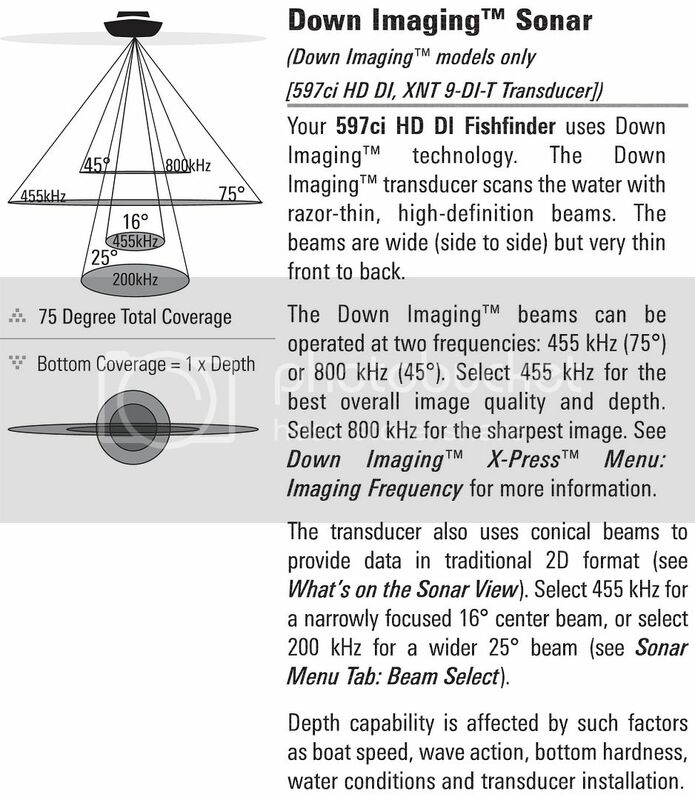 The illustration below will help you to understand how Down Imaging works compared to the traditional sonar. 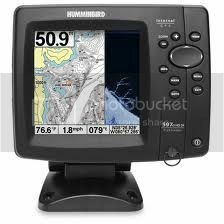 To summarize, as you have read I chose the Humminbird mainly because I had the luxury of both sonar and DI. At the time I thought it was like having training wheels while I learn to understand the new technology of Down Imaging. After 2 years using my Humminbird I have learned both have their advantages and uses. 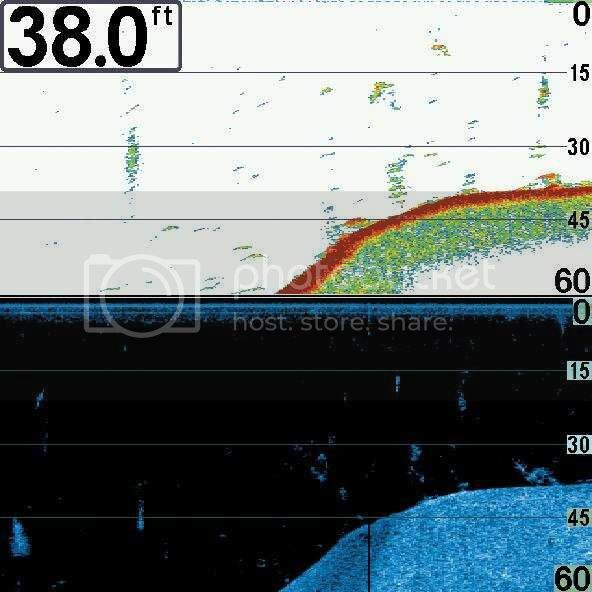 You will get a clear picture of the bottom structure in the body of water your fishing using the DI, finding and seeing fish is still easier, for me anyways, using sonar. If you have the luxury of having 2 units on board, one with Sonar, one with Down Imaging, then picking one manufacturer over the other wouldn’t really be a wrong decision. In a kayak I would have difficulty using 2 separate units. If you want to have the benefit of Down Imaging, Humminbird would be a wise decision for the kayak angler.